Melon & mint make a wonderfully refreshing dish however on my latest plateful of virtue it is the quinoa that is the hero of the piece, what with being a superfood and all it has to be the headliner. There’s been far too much cheesecake consumption going on and it’s time to ‘cop on’ to myself for a while i.e. eat some good stuff. I made up a large batch of this quinoa which I’ve been stuffing into salad laden wholemeal pittas with pesto for my lunch and having it in lieu of roast spuds with a chicken dinner. That was hard; no spud, gravy or crispy chicken skin this time for me but instead the bulked up quinoa which was a tasty substitute for the spud and good and filling. Method:Peel and finely chop the onion and crush the garlic. Soften the onion and garlic in a large frying pan with the olive oil over a medium heat for 5 minutes. Add the quinoa grains and mix with the oil, garlic and onion and cook for two minutes to take on their flavours. Add the water and bring to the boil. Simmer for 15 minutes until quinoa is cooked and has absorbed the liquid. Meanwhile chop the green pepper, cucumber, spring onion. Finely chop 1 or 2 mint leaves (1 if large – don’t want to overpower). 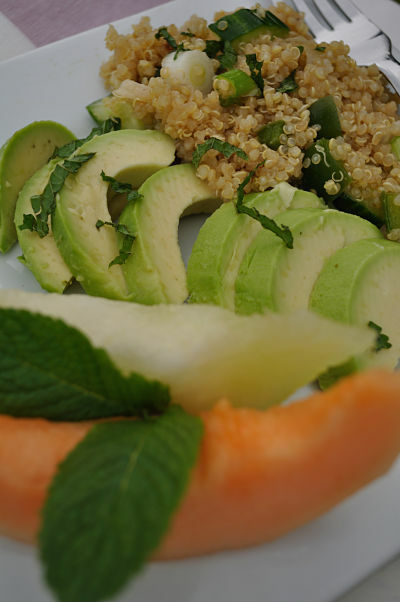 Combine the cooked quinoa with the green pepper, cucumber, spring onion, mint and the juice of the lemon. Mix well and season with salt and pepper. 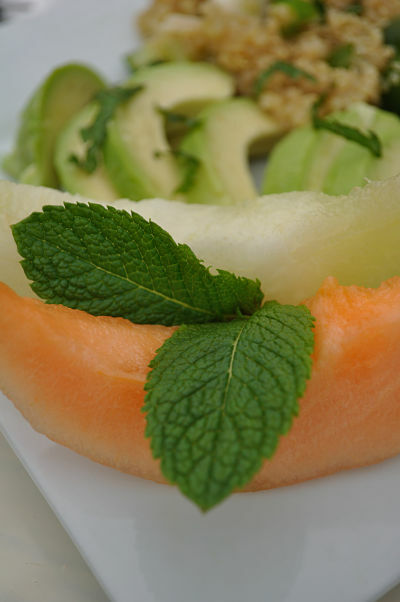 Can be served hot or cold as a side dish – served above with melon, mint, avocado and squeeze lemon juice.